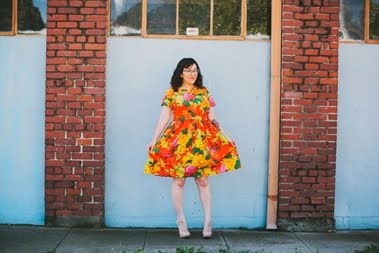 One of my New Years Resolutions was to make at least one garment a month. I am happy to report that I have accomplished that, but unfortunately the amount of time I spend quilting has dropped :( This last week I have been focusing on finishing a quilt for my little sister in law, Ariana. A close up. 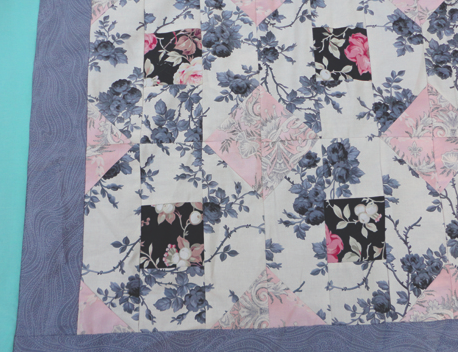 It was not particularly a hard quilt to make, I have just been a slacker in finishing it. 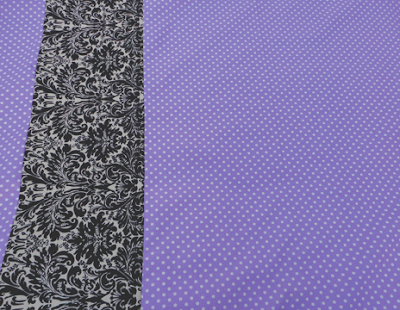 I know that the back doesn't really match the front, but I thought this fun fabric combo would be perfect for a nine year old that loves purple. 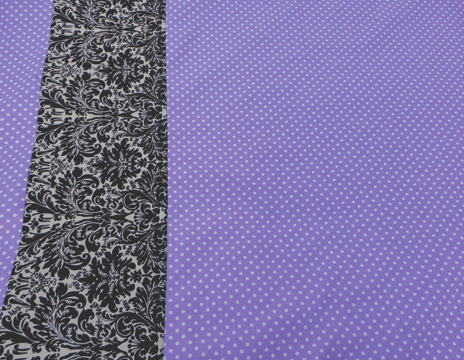 The quilt front was slightly bigger than the width of the uncut piece of polka dot fabric, so I cut the polka dot fabric into two unequal pieces and added 8 inches of the black and white fabric in between. 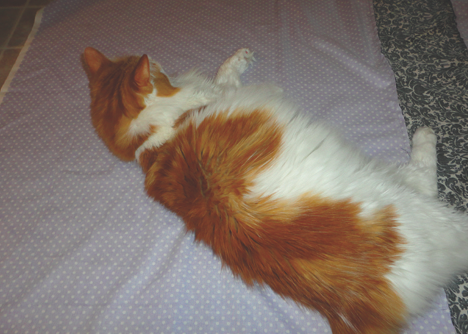 When you are making a quilt it is very important to have the back larger than the front. Lebron was not into the idea of me sandwiching the front, batting, and back together. Putting it all together is always a struggle for me because the animals jump on the fabric. My neighbor Lora was nice enough to come over and keep the animals away from the kitchen! 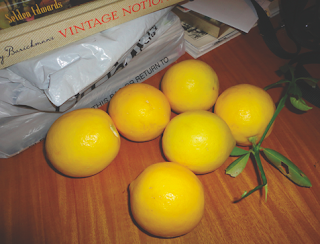 She even brought me some lemons from her yard. Not to sound like a weirdo, but don't fresh lemons smell amazing?? I want to make these lemon bars that Christine made. I have the same problem with the cat getting on my quilt top when making the quilt sandwich! I end up locking him in the bathroom while I baste. He's not a fan, but it works. And yes, I LOVE the smell of fresh lemons. Our garbage disposal recently bit the dust and I sorely miss the smell of grinded up lemon grind. I wish I could put the animals in the bathroom, but two cats and one dog might not be the best combo!! :) Next time I might have to go to the garage. Not weird at all! I loooove the smell of fresh lemons. Mmmmm makes me want to see if any are left from the lemon bush in my front yard. One of my favorite things to do after I've juiced a lemon is to cute the leftovers into chunks and drop them down my garbage disposal. Makes it smell amazing! Anyways, totally love the quilt! I need to finish mine too. I just realized last week that I haven't touched it since last year. All I have to do is to actually baste it all together but I just haven't made the time. Maybe this post will motivate me! I always feel that I never have time for it all! I'm always wishing that I made this or I made that but then I appreciate all the things I have made instead of all the things I haven't made. nice work Erin, you really have made so many things in the last 5 months! 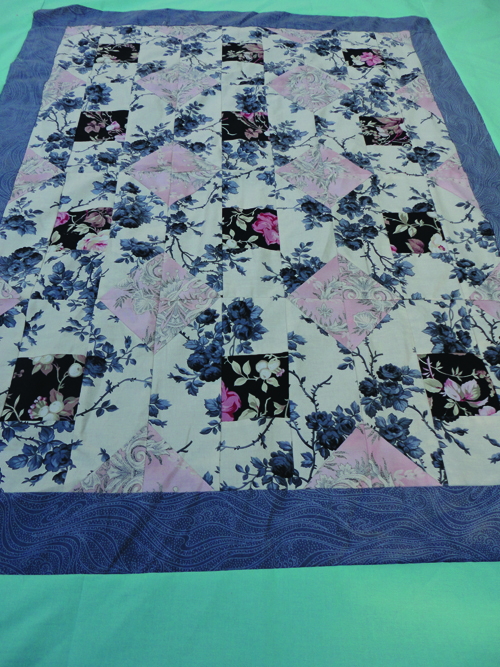 The quilt looks lovely and I'm sure your s-i-l will love it :) What a wonderful gift. Your quilt is so very lovely - your s.i.l. will love it! !